Today was a good day. 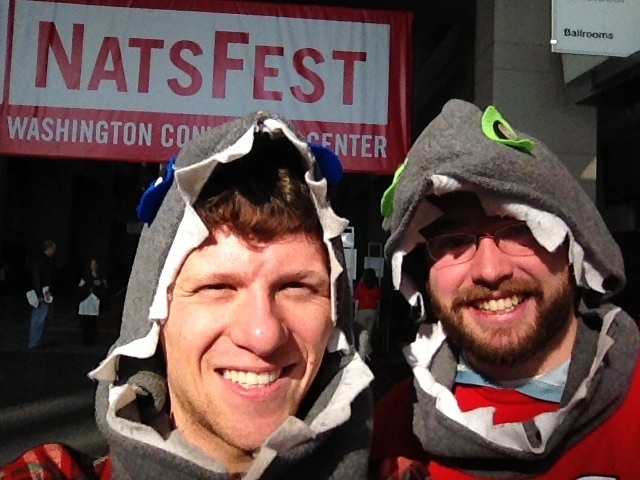 It was a cool brisk morning and the perfect day to dust off the old Shark Hoods, which have been in cold storage since Game 5 of the NLDS (if anyone knows of a dry cleaner that specializes in aquatic-themed-animal-headgear, please let us know). 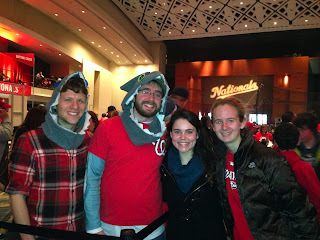 We hopped on the Metro, which was shockingly on time, and headed to the Convention Center for the biggest event in the Nationals offseason, Natsfest. Unlike NatsFest two years ago, we didn't have any mini sharks in tow so we could swim through the large crowds with relative ease. We also FINALLY met one of the all-time greatest Shark fans, who was featured right here on this blog a couple months ago. That's right, we met SharKIDina and his family! Jawsome! 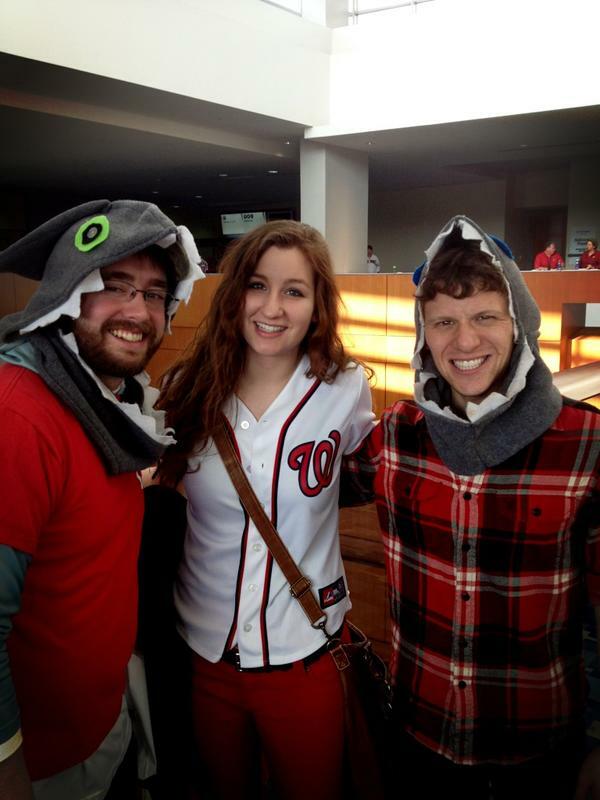 All of you Shark fans we spoke to were great and displayed some serious Sharkitude. Thanks for the support! Plus, we had the chance to speak to both Bob Carpenter and Danny Espinosa following one of the Q & A sessions. We asked Bob Carpenter what he thought about the "Shark movement" and handed him one of our business cards. He was impressed/embarrassed for us that we had our own business cards, but promised to check out the site "later tonight on the plane." (Hello Bob). He explained that when a team is winning, weird stuff starts to happen (like The Shark Movement) and some of it is bizarre and doesn't make any sense, but "as long as the fans are going to the ball park and having fun, that's all that matters." We also asked Danny Espinosa what it was like to play with The Shark. He said that Shark is "a great teammate" and that he will be arriving to spring training "weighing 230 lbs- all muscle. He doesn't have an ounce of fat on him." He showed up 100% two years ago and we were the first website to have exclusive photos of him training this offseason, so we don't doubt Danny's claim. Overall, it was a jawsome day and made us that much more hungry to sink our teeth into the upcoming baseball season... We're ready (as displayed by Tyler's Danny Espinosa style beard), are you? Ok, we lied, we're not ready. Please contact us ASAP @sharkadina or sharkadina@gmail.com with some dry cleaners who specialize in Shark hoods. Thanks.